We are living in end times, a time of high deception. Though we do not know the day Jesus will return, God reveals many signs in the bible, and tells us to watch for them, so we will be prepared for our Messiah’s second coming. Elevated deceit is a big red flag for end times. But, because deceit comes cleverly disguised, it’s difficult to know when it’s present. We must constantly and consistently pray against it. Christians are not immune to being deceived by others, so we especially need to be praying, and actively reading God’s Word. The bible contains instructions on how to both identify and avoid deceit. We also need to ask God to fill us with His Holy Spirit, and to point us towards the truth. Matthew 24 should be read by every Christian. It discusses the incredible deceit that will overwhelm the world during end times. It gives explicit instructions on how to identify the antichrist, who will set himself up in God’s holy temple, blaspheme the name of God and demand to be worshiped. As if that weren’t horrific enough, people will witness the greatest deception of all, “The ‘abomination that causes desolation,’ spoken of through the prophet Daniel ” (in Matt. 24: 15) which will signal the end of the world as we know it: the antichrist will claim to BE GOD! People will fear the antichrist and follow him to avoid being killed. But they will also be fooled by the miracles of the antichrist, and blindly choose to follow him, based on having fallen for his lies, because they have refused to accept God’s truth! This is spoken of in 2 Thessalonians, chapter 2. 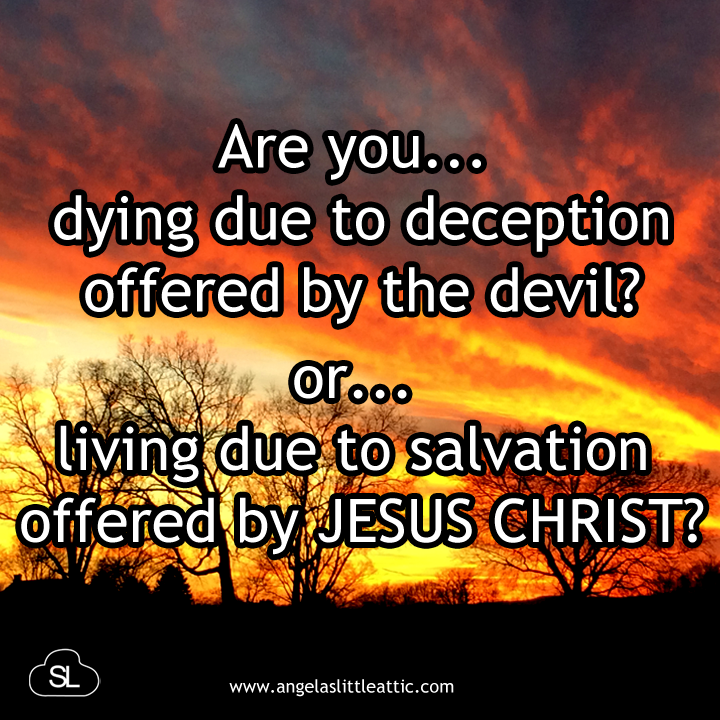 The people’s reverence for the antichrist will come from the greatest deception ever known. They will think he has come to save the very people he cannot wait to destroy! “He will oppose and will exalt himself over everything that is called God or is worshiped, so that he sets himself up in God’s temple, proclaiming himself to be God” (2 Thess. 2:4). The silver lining is that the “abomination of desolation” will not be overlooked, and it will not go unpunished by God. In fact, it will signal the arrival of the second coming of Jesus! Jesus will come to save us, and he will destroy the antichrist! “Then will appear the sign of the Son of Man in heaven. And then all the peoples of the earth will mourn when they see the Son of Man coming on the clouds of heaven,with power and great glory. And he will send his angels with a loud trumpet call, and they will gather his elect from the four winds, from one end of the heavens to the other” (Matt. 24: 30-31 New International Version). This is also spoken of in the 12th book of Daniel. We don’t have to fall for deception. For Christians, there should be no confusion about where Jesus is or who he is. God clearly says not to listen to anyone at all who claims to know where Jesus is. God says Jesus will find us, and come get us! We will escape having to experience unimaginable peril and distress, such as the world has never known. We will also escape Hell, as we go to live eternally with Jesus in the Kingdom of Heaven. As we wait for Jesus to return, our job is to share the gospel with those who are dying in deception. It will become more and more difficult, for people to see and hear the truth: All people can have life through salvation in Jesus Christ. “At that time if anyone says to you, ‘Look, here is the Messiah!’ or, ‘There he is!’ do not believe it. For false messiahs and false prophets will appear and perform great signs and wonders to deceive, if possible, even the elect. See, I have told you ahead of time” (Matt 24: 23-25). “For such people are false apostles, deceitful workers, masquerading as apostles of Christ. And no wonder, for Satan himself masquerades as an angel of light. It is not surprising, then, if his servants also masquerade as servants of righteousness. Their end will be what their actions deserve” (2 Cor. 11:13-15). “The Spirit clearly says that in later times some will abandon the faith and follow deceiving spirits and things taught by demons. Such teachings come through hypocritical liars, whose consciences have been seared as with a hot iron” (1 Tim. 4:1-2). Tell the world about Jesus, while there’s still time. Even if the world does not end today, many people’s lives do. Jesus is the one and only way to the everlasting! Share his love with everyone you know! “If you point these things out to the brothers and sisters, you will be a good minister of Christ Jesus, nourished on the truths of the faithand of the good teaching that you have followed” (1 Tim. 4:6). Terrifying times in which we live. Thank God for the truth and salvation He offers us. Amen! People need only look beyond their own selfish pride, and recognize they cannot save themselves. We could never be wiser than our God, who is our Creator! He’s given us everything we need to know, outlined in the bible. Jesus and his truth are available to everyone! God bless you, Jeanne! So many important truths in this post. I will share it on my Facebook page. This isn’t the popular thing to be saying now because people, including some believers, are averse to being confronted with the truth but everyone needs to hear this kind of stuff over and over because we are, without doubt, living in the last days. May you remain vigilant and keep playing the watchman role God has called all His children to in Jesus’ name.